Serving safe food is not an option, it is a requirement. Regardless if you work in a kitchen or in a Food Bank, knowing how to safely order, receive, store, handle, cook, and serve food is extremely important in any food service establishment. ServSafe is a nation-wide program to provide food facility operators the basic knowledge to serve safe food. 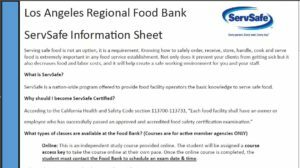 The Food Bank provides an option of purchasing an online course code, textbook, and/or exam. If the online course is purchased, the student will be assigned a course access key to study online at their own pace. Once the online course is completed, the student must contact the Child & Nutrition Programs Department at (323) 234-3030 x 173 or x 177 to schedule an exam date & time. Once you pass the exam, you will receive a ServSafe certificate that is valid for 5 years in the state of California.